Oliver Jarvis, writing for Travel Magazine, experienced a life changing reality on the side of Asia’s most active volcano. Every now and then life pulls the silk rug from under your feet and leaves you lying on your back – this sibling-esque prank is often referred to as a ‘reality check’. 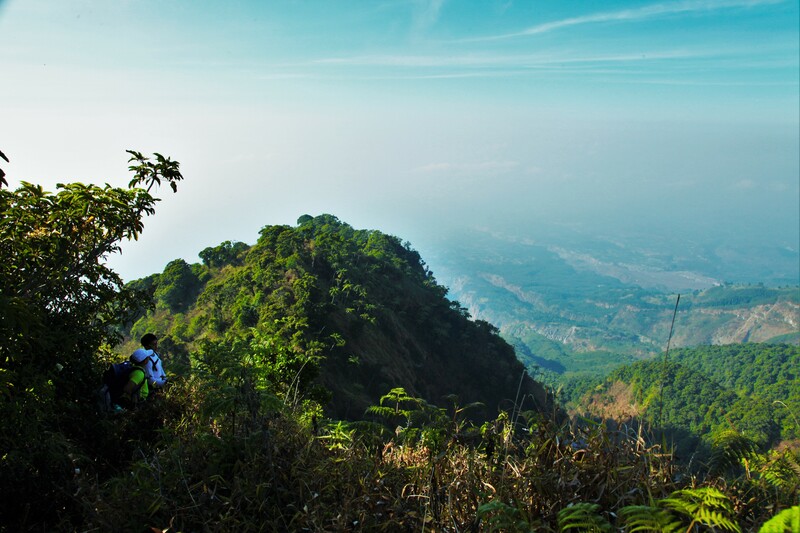 Dangling off the side of Merapi with one hand on a fern root and the other on the arm of Khalid was my reality check. 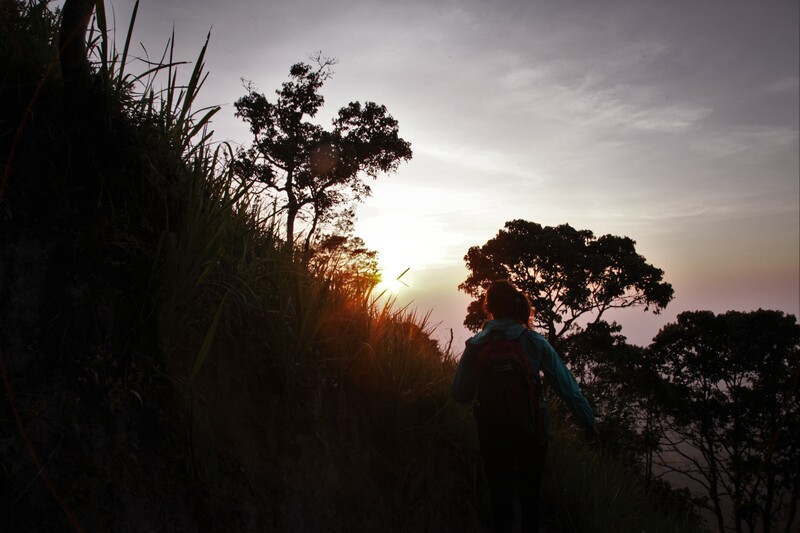 I had taken too lightly to climbing the most active volcano in Southeast Asia, and when the path I was walking on suddenly gave way, I realised that this wasn’t just a gentle climb up a hill in South England, instead the climb turned out to be one of the most mentally draining, yet emotionally rewarding challenges I had ever been put through. Known to locals as Fire Mountain, Gunung Merapi sits on the border between Central Java and Yogyakarta like an ‘I’ve-hit-puberty-too-soon bully’ in the playground with his two comrades, Merabu and Sindoro. There have been regular eruptions since 1548, with the most recent in 2010 where 30 people died. 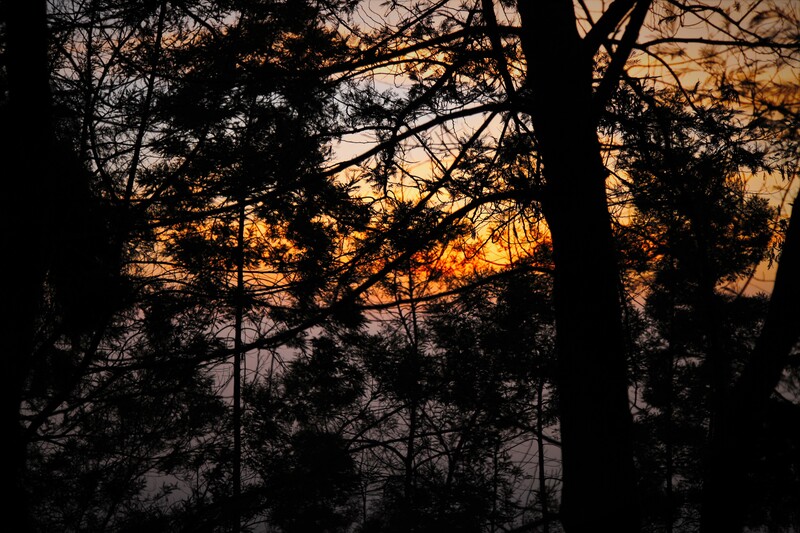 Our walk was to start at 4:30am, under night at Desa Deles, the ranger’s hut at 1300 metres. Despite feeling incredibly tired, and every part of my conscious brain asking ‘Why I doin’ this?’ in a Bubba from Forrest Gump accent, my spirits were still high – after all by 10am that day [if all went to plan] I’d be up 2,930 metres high on the summit of Merapi. Of course, every great journey has to have its hurdles [look at Homer’s Odyssey, Harry winning the love of Sally and Justin Bieber’s path to spiritual enlightenment], and our first hurdle was 10 minutes into our walk with our very German, German tour leader called Carl who’s general persona was as if he was the sole inspiration behind Lance-Corporal Jones’ character in Dad’s Army. It turned out that his planned 9 – 10 hour walk was inaccurate, and was more like 12 – 15 hours, as this was his first time walking the route. The smell of sulfur was already in the air, and our torches pierced through a feint haze that slid up the cliffside, our visibility was low and we had to mind shrub, after fern when making our way up the gentle incline. Our three Javanese guides were trekking without torchlight [one was even in sandals], they used the moon and the stars to guide them like the Three Kings in a low-budget nativity play. When the sun rose Merapi appeared like a sleeping giant covered in ash and scars from its own previous eruptions. The air felt cold and clean [or we’d got used to the stench of sulfur] and we had our first rest break with Merapi as our backdrop. Some people took photographs on their compact cameras and Iphones, whilst the elder hikers stared up at the summit as if engaged in some sort of stare off competition that they were bound to lose. Looking back down our path we could see the vast settlement that bowed down by the foot of Merapi. It’s hard to believe that so many people still choose to live there, but locals have their reasons; ideal farming soil and religious beliefs keep them in a seemingly full prostration bow at the bottom of their bipolar God. Many believe that the previous eruptions are a result of spirits being angered by not receiving gifts, which they offer them at the summit annually. In a fairytale setting, with the sun rise rays flowing through the trees, Indonesia had created a Snow White morning, and a false sense of security. The hike was about to get harder, as the gentle route that ascended up the side in the fashion of a slalom suddenly inclined to meet the demands of the cliff face. 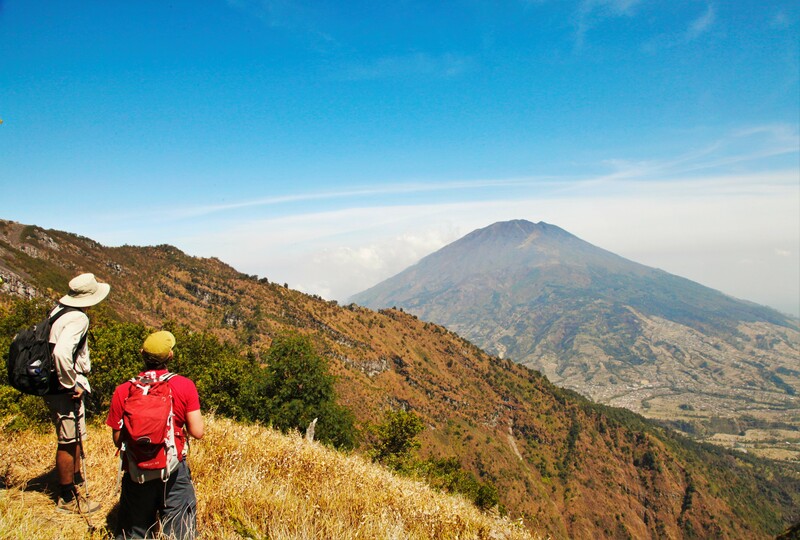 It’s recommended to wear ‘proper’ hiking shoes when climbing Merapi [unless you’re a Javanese guide], anything without a grip will make the walk harder than walking on ice without ice boots; as every step becomes a conscious effort. The clear pathway was soon covered by overgrown ferns and shrubs, and the roots seemed to snake their way across the path perfectly to trip us up. As the sun came up we had to wrestle with branches, and grab what we could to pull ourselves higher – luckily our legs were covered as clear cut grazes on our ankles would have been inevitable. We’d sometimes encounter clearings in the jungle where we could peer out, always seeing Merapi to our left staring back at us like one of those brick-wall posters that have the eyes that follow you. The group that originally consisted of 15 people was now falling, as even experienced hikers thought they had met their match, or it just ‘wasn’t their day’, and made the lonely journey back to the mini bus. Even the hike leader, German Carl, who had to stop in a very un-German way [Carl had suspiciously caught a chesty cough when the path started to get steeper], was defeated around 2,000 metres up. In the end only five of us remained, with the guide in sandals who had now fashioned a ragged towel into a head scarf that made him look like Little Bo Peep. It was a unanimous decision by all of us left to make it to the top. 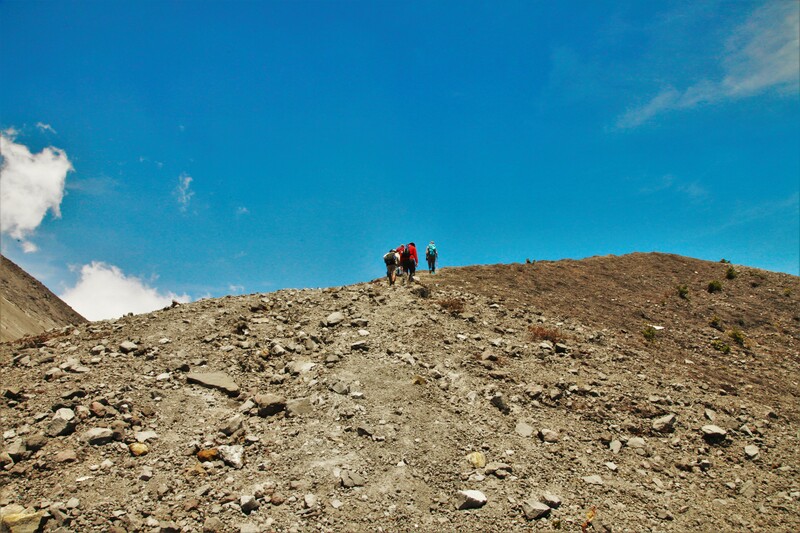 We were conquering Merapi whether our blisters bled, our water ran out or Bo Peep lost his sandals. 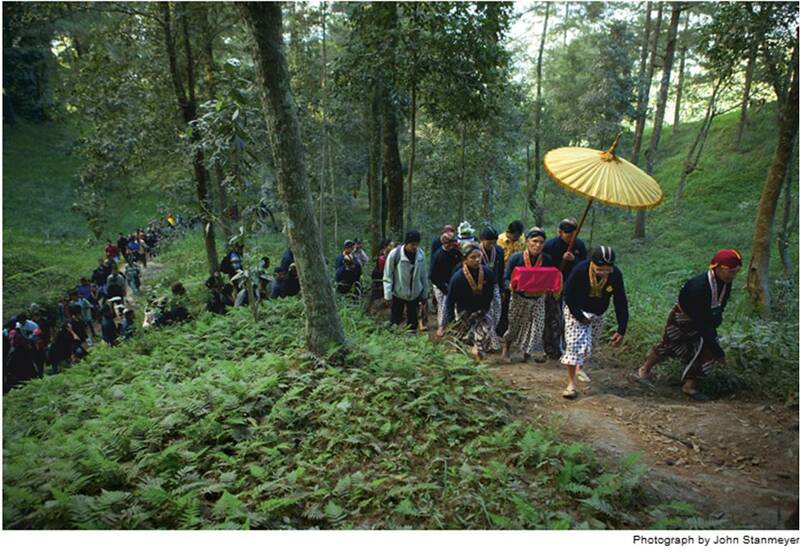 The steep incline under thick forest meant that we would gain altitude at a faster pace, and gradually the hills, and rice paddys below shrunk and cold streams of air came and went as we entered different air pockets. We found ourselves alone on the side of the mountain, no sign of Indonesian settlements in the distance, or anybody on the mountain top – it was like the Lost World, we were unaided on the belly of Merapi. The ash was becoming difficult to grip with my shoes, and I found myself having to climb, as if bouldering, up vines and branches just to follow the path. It was then that I misplaced my foot and the side of the path that I was on collapsed. Dangling off of a cliff face isn’t like they show it in the Mission Impossible films; I wasn’t coolly gripping the edge of the cliff with my fingers, nor was I suspended up in mid-air like a character from Looney Toons, instead I was holding onto a fern root for dear life as Khalid grabbed my arm and yanked me back up. I wasn’t the only one, as our trail grew even tougher we’d often slip down the cliff before grabbing a branch, or fall awkwardly on an ankle. 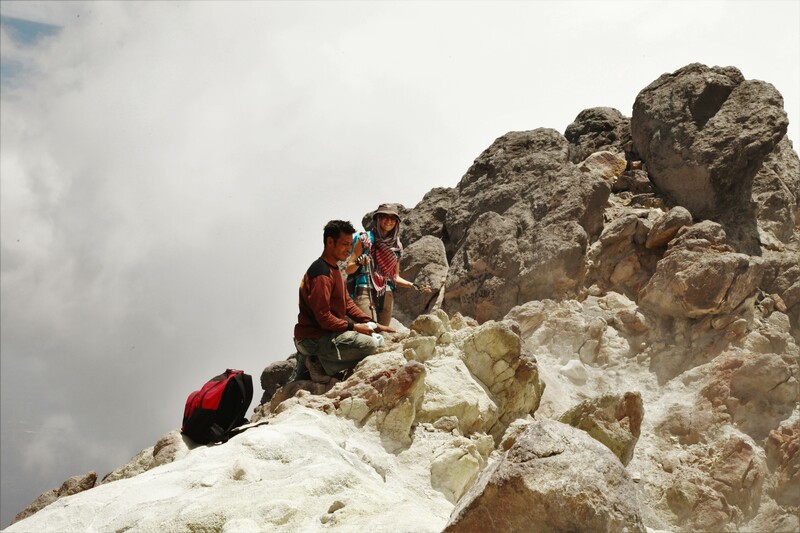 We reached a ledge, and could, for the first time, measure our height to Merapi’s younger cousin – Gunung Merabu. Shortly after our stop at around 2,500 metres (10:30 am), we reached the dusty, dead plain of Devil’s Bazaar. Every step you took, a rock would tumble down behind you and ash would be kicked up into your shoes and mouth. We passed weather stations that looked like they hadn’t been touched since the Seventies, and yellowing shrubs trying to survive as we continued our walk through what felt like the world’s most depressing desert getaway. We were now face-to-face with the clouds that wrapped around our ankles and passed along the cliff tops. The head of Merapi stood above us and the surrounding wasteland with the white haze of sulfur circling it like a halo, we had reached the final stretch. The Devils Bazaar is where the locals gather every year to place their offerings to calm the spirits of Merapi, the volcano has erupted every 5 – 10 years without fail, yet the locals still make the treacherous climb to hopefully bring peace between themselves and the mountain. 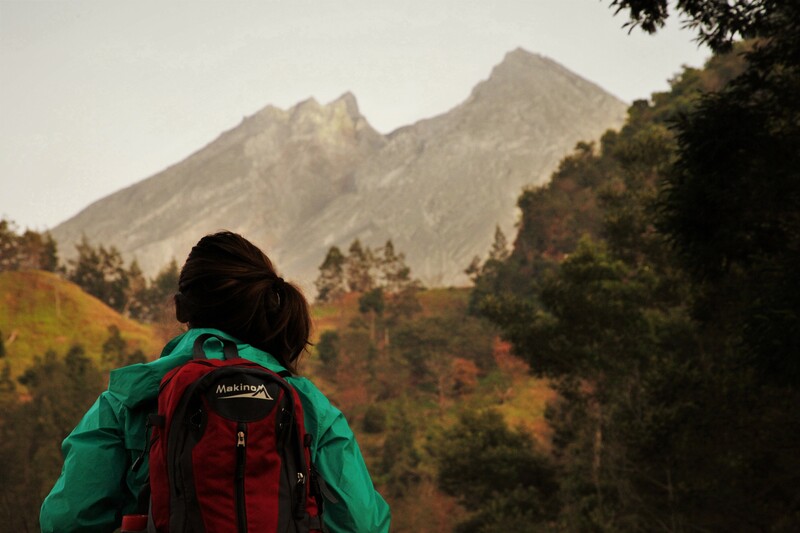 With smoke rising from the peak of Merapi we began our ascent. The remaining point was like an old pub fireplace covered in ash and dust which covered our faces as we tried to scramble up the cliffside on all fours. Try walking up a metal slide with your socks on, and then pour Fairy Liquid down it and try walking it again – every step we took we fell two steps down. Even Bo Peep in sandals seemed to tire, as more dust kicked up into our faces and the wind blew the clouds and ash into our sides. But I had to see the top, and so I pushed up the cliff face, hopping from rock to rock like a rabbit with a foot infection. Standing on the shoulder of a giant, they say you get to see exactly how the giant sees the world, and when I broke through the clouds I was surrounded by a deep blue and the air felt clearer. 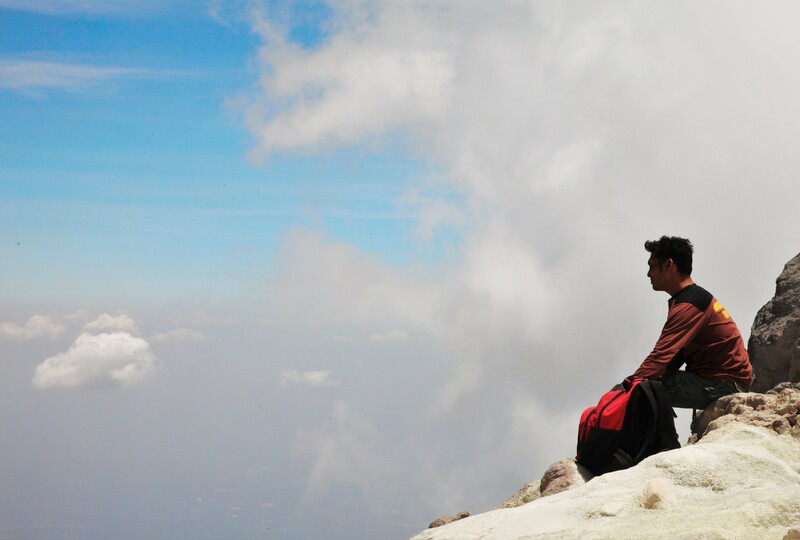 Finally I had reached the summit of Merapi. I clambered up to the peak, which was an uneven rock around the width of a boardwalk and surrounded by a 200 metre crater drop which was covered by eery sulfurous fumes that seemed to escape from every rock crack. I was an ant on a pen nib, anxiously looking around, watching my step. The others joined me, and we waited a while in silence as the clouds sift through our hair, and the monster of Merapi quietly slept. 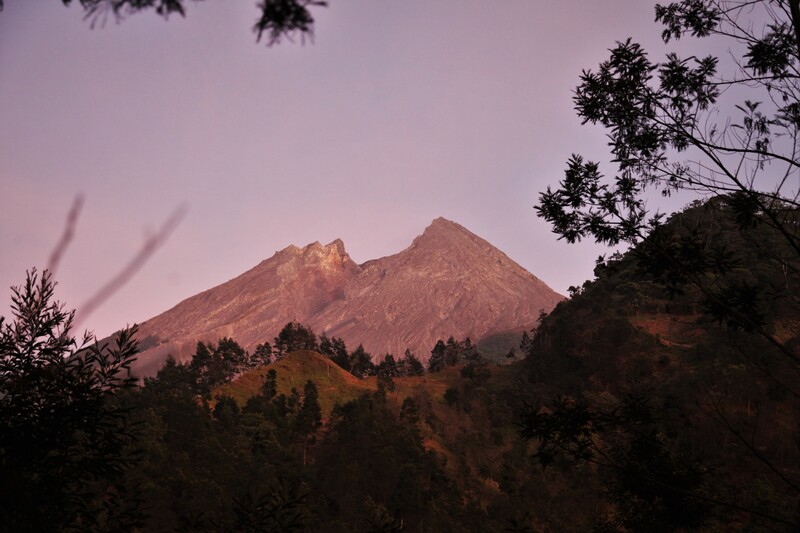 If you climb Merapi for sunrise, you can see the lava bubbling below. 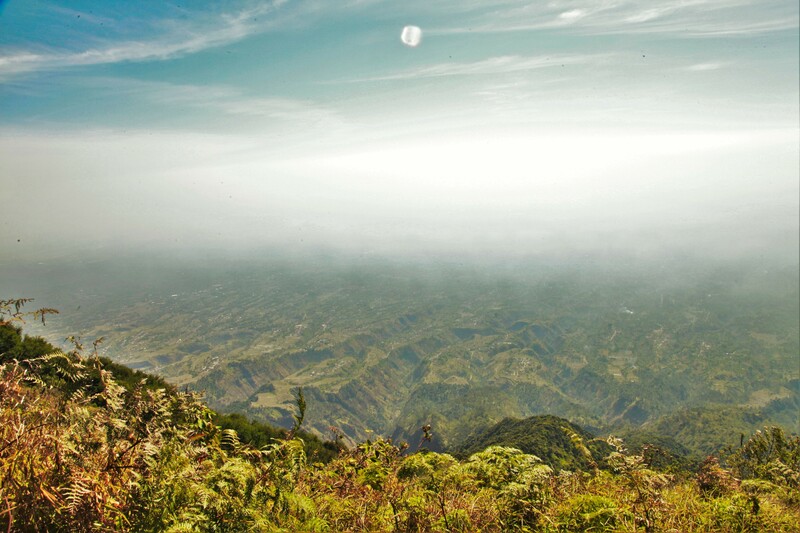 On a clear day, the surrounding area comes alive, and you can see the great pillars of the Indonesian ‘Ring of Fire’ on the horizon. We had to get down before nightfall, and luckily our guide knew a few tricks to get us down safely and quickly [no helicopter or ski lift]. With our feet we skied down the side of the mountain, kicking up dust and dislodging rocks. 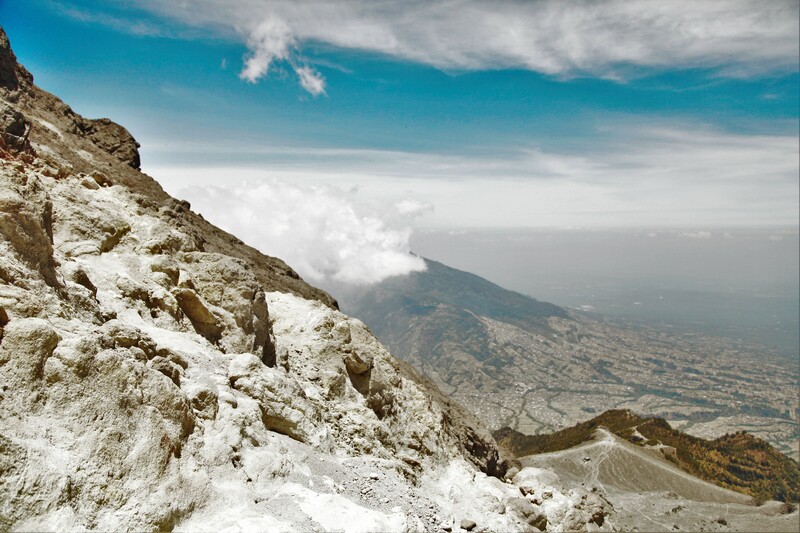 Climbing Merapi was a huge challenge, but the summit will reward you in its own special way.